The area around Kottbusser Tor has been an epicenter of Turkish culture in Berlin for decades. The amount of Turkish restaurants and kebab shops there is overwhelming, but none of them specialize in fish like Taka does. The interior is small and modestly decorated, and almost always full. In the warmer months, there’s plenty of outdoor seating on the small square out front they share with the other cafés and restaurants on that block. It’s a family operation – they do one thing, and they do it really well: fish, fish and more fish. 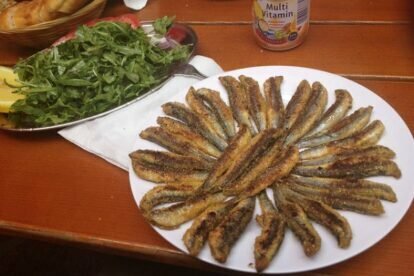 The entire menu is worth trying – get the battered and fried sardines served with a mountain of fresh rocket, lemon, tomatoes and onions (see photo) or the prawns drowned in garlic butter. But I love their sandwiches the most. My personal favorite is the salmon – grilled medium-rare to order, served on a toasted baguette with rocket, onions, tomatoes, a generous squeeze of lemon, and a big gulp of Turkish olive oil. Wash that all down with a refreshing Ayran (salty Turkish yogurt-based drink). Hungry yet? Get thee to Taka!